The former first lady helped celebrate the comedienne's 60th birthday. 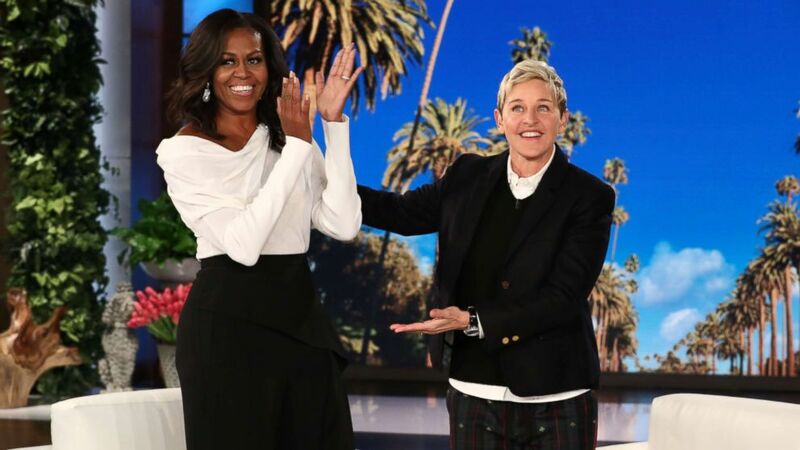 Former first lady Michelle Obama decided that Ellen DeGeneres' birthday was a good time to re-enter public life. 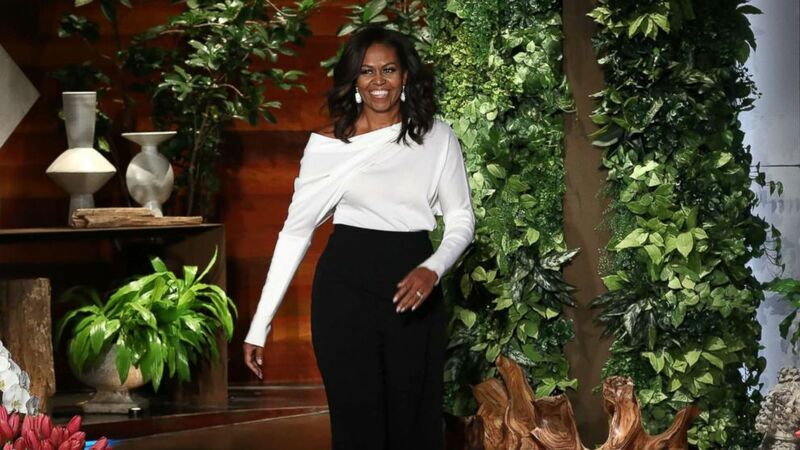 Obama made her first television appearance since leaving the White House on the talk show host's 60th birthday episode, which was filmed earlier this week and aired this afternoon. At one point during the interview, DeGeneres said that she feels "the world is a very scary place right now" and asked Obama her take on the current state of affairs. "Yes, people are afraid. But then there are people who feel good about the direction of the country. So that is what makes this country complicated. It is made up of so many different people from different backgrounds. We are this mosh pit of society," she said. "Sometimes there is a rub, but the thing that we have to remember, the thing I learned in the eight years that I was in the White House is that what we do every day in our lives, the good things that we do every day ... we show empathy and care for each other. We do have a lot in common. That is what it means to lead with hope and not fear," she said. Obama encouraged Americans to continue "to love each other, take care of each other, to show empathy." "You can't do that only when people make you feel good or safe. We've to do it all across the board. We have to be an openhearted nation, and that's who we are, and that's the truth of who we are. We can't lose sight of that. And let's just keep living our lives like that every single day and forget what they are saying in Washington. That's not necessarily who we are," she said. The two women have been friends for years, with Obama making multiple appearances on "The Ellen DeGeneres Show" during her husband's presidency. "Don't you miss her?" DeGeneres said to the cheering audience when Obama initially sat down for the chat. (Michael Rozman/Warner Bros.) Michelle Obama appears on the Feb. 1, 2018, episode of "The Ellen DeGeneres Show" in Burbank, Calif.
Obama opened up about her post-White House life, and shared some details about the family's new house, which she said is "in the neighborhood, down the street from the White House." "We stayed in Washington because Sasha, our youngest, is a junior" in high school, she said. "It is odd because now I have a door and a doorbell and people actually trip out when I come to my door and I open it. And the dogs, Bo and Sunny, don't know what a doorbell is so the doorbell rings and they're like 'Um, I never heard that before,'" Obama said. She said that she picked out the family's house and oversaw the unpacking and decorating because her husband "was being the president when we moved so he didn't really have time to go househunting." He may be regretting that decision now, apparently. "He still talks about this. He got so shortchanged on this whole deal. He doesn't have enough closet space -- sorry -- he's got the smallest room for his office, and Sasha actually killed in this house. She has like this two-room suite it's all decked out. She's got like a living room area and a bedroom and she designed it, so he's really hating on her," Obama said. He's not the only one. Malia, the eldest Obama daughter, is now a freshman at Harvard University, and her mom said that she has "a room up in the attic somewhere. She's away at college -- you don't waste rooms on college kids!" 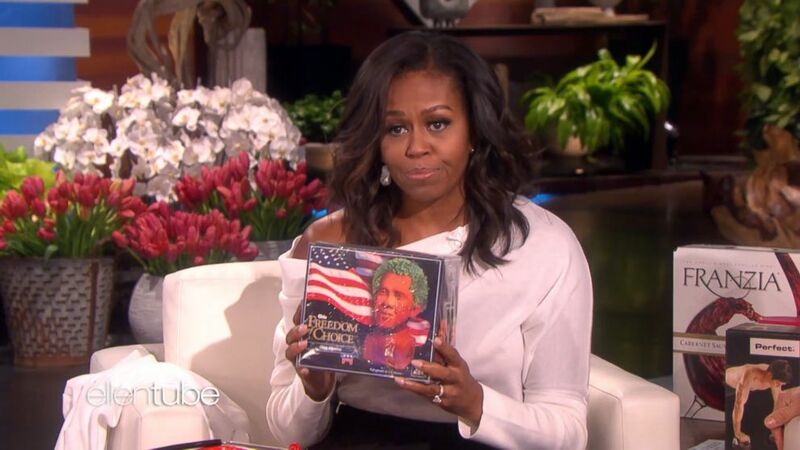 (Warner Bros.) Michelle Obama presents Ellen with a "Chia Obama" during her guest appearance on "The Ellen DeGeneres Show," Feb. 1, 2018. An earlier clip of the interview that was released in advanced included the former first lady recounting the awkward moment when she didn't know what to do with the gift that Melania Trump handed her ahead of the inauguration. A less confusing exchange unfolded between Obama and DeGeneres with the gift for the host's 60th birthday. In a nod to a past appearance that Obama made on the talk show where she and DeGeneres went shopping at CVS, the former first lady gave her a selection of gifts from the convenience store, including boxed wine (which they drank during their shopping trip) and a Chia pet in the shape of her husband's head.